Shell plans to enter Britain’s offshore wind market by acquiring seabed leases or taking stakes in existing projects, despite the country's impending departure from the European Union, the head of the company's New Energies division said. Oil firms are increasingly building portfolios of clean energy projects to satisfy investor demands that they reduce their carbon footprint. Shell previously said it would spend $1 billion to $2 billion a year on green technology. "We absolutely would like to get a position in the UK offshore (wind) market," Mark Gainsborough, executive vice president at New Energies, told Reuters in an interview. Many international firms, such as automakers and nuclear plant developers, have shied away from fresh UK investment with Brexit creating uncertainty over the future of the country’s economy. But Gainsborough said Britain's plans to leave the EU next month would not dampen the company's interest in its offshore wind industry. "The thing that is more important is there continue to be supportive government policies," he said. 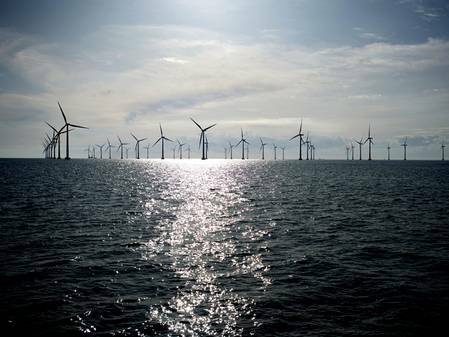 Britain is the world’s biggest offshore wind market, hosting almost 40 percent of all globally installed wind capacity, and the government is this year expected to outline planned support for the offshore wind industry. Gainsborough said the company could seek to buy a stake in or acquire an existing British offshore wind project and that it planned to take an "active role" in bidding for a British seabed offshore wind lease expected to be tendered this year. Shell has been successful in similar seabed lease sales in the United States. Under such deals, developers first acquire the seabed rights to build wind projects in certain locations. Shell's Atlantic Shores Offshore Wind joint venture with EDF Renewables and its Mayflower joint venture with EDP Renewables have U.S. seabed leases capable of hosting up to 4.1 gigawatts of wind power capacity. As part of efforts to boost its clean power portfolio, Shell also said it could bid for Dutch energy company Eneco with Dutch pension fund manager PGGM. Gainsborough said Eneco’s renewable power generation, retail and B2B customers and power trading teams would be a good fit for Shell's plans to build the New Energies portfolio. "To make sure we stay relevant in the energy transition, we need to look at how we can bring lower-carbon solutions," he said. Analysts have pegged Eneco’s value at around 3 billion euros ($3.4 billion). Gainsborough said bidding for Eneco did not rule Shell out of other big-ticket acquisitions. "We are not a single-bet company," he said. "We never want to be in the position of being dependent on one deal to be make or break for the growth of the business."